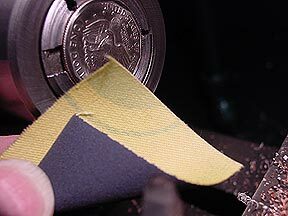 Soft coins are coins which are worn down and silently slide off of each other. This is a very useful feature for magicians. In the past magicians had to seek out worn coins from coin dealers. 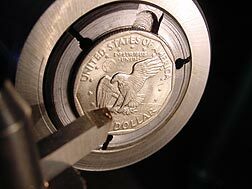 For several of the items that I manufacture, I wanted soft coins - so I developed this method for making soft coins as needed from whatever coins I wanted. 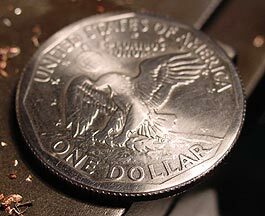 Note: I am not currently making and selling soft coins as stand alone items - only as components of other items that I make. 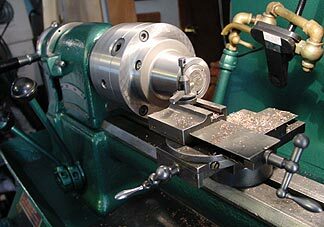 I use a precision variable speed lathe for making my coin gaffs. 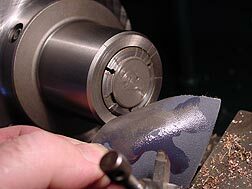 The coin to be softened is mounted in a specially machined collet. Only the smallest amount of metal is removed. The idea is to flatten the coin. On this coin the metal being removed is all from the raised rim. After this light machining, fine emery cloth is selected. Lubricating oil is added to the emery cloth. 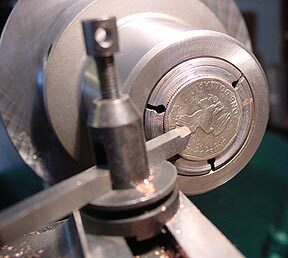 The lathe speed is set to at least 3000 rpm and the coin surface is smoothed with the emery cloth/oil. You may see the small amount of metal that has been removed as residue on the emery cloth. to very slightly round over the now sharp edges. The cleaned off smoothed coin surface now looks like this. I often use a scouring pad for the next and final smoothing. 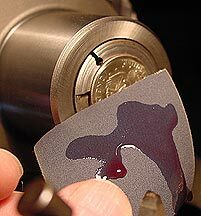 The smoothed coin will look like this. This is another view of the coin after scouring pad prepolishing. It is critical that the sharp edges are smoothed over with the scouring pad. 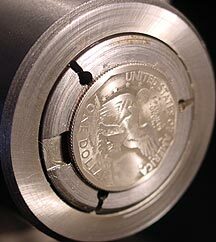 This allows completely silent movement of the coins. 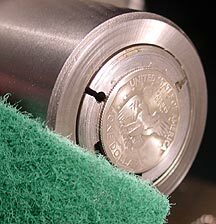 The soft coin after polishing with a buffer is shown on the right. The coin on the left is as found in circulation. 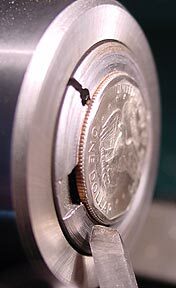 Notice that this method of softening a coin does not destroy all of the detail of the coin. The coin so softened will merely appear to be worn; but operate silently for magicians. This is why I have developed this particular method for softening coins - nothing looks fake. 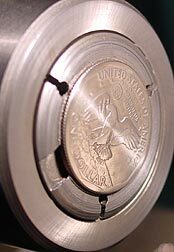 If desired, the coin may be chemically aged before the final buffing to bring out details. Click here to go to my magic web pages.